When civilization grows too confining, it's a relief to be able to withdraw into a handsome home in the wilds—especially one with an imposing wall around it, to keep out beasts and bandits. 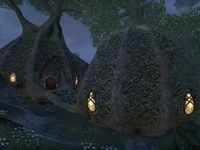 Bouldertree Refuge is a medium player house in southern Greenshade. After entering the estate there is an open yard with a round exterior house middle of it. From that there is a ramp following into a door leading to the interior of the area. The interior consists of one relatively small round room with a fireplace. This house was added to the game world in Update 12. Landowner 10 Obtain and enter any of the following classic homes. Landlord 15 Obtain and enter three of the following classic homes. Land Baron 50 Obtain and enter five of the following classic homes. This page was last modified on 19 November 2018, at 07:14.